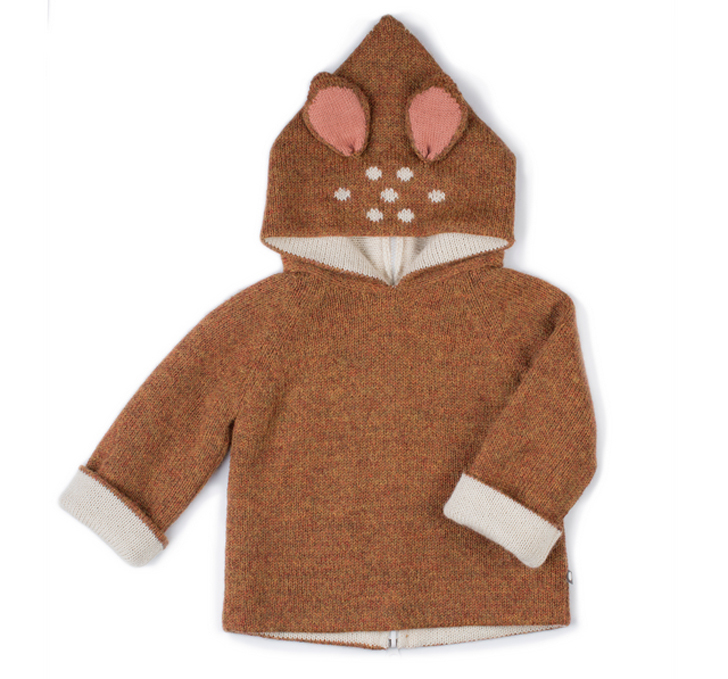 Getting our tots bundled up for the cold weather can be quite the process, but Oeuf‘s Bambi-inspired collection is so adorable, you won’t even mind getting them all suited up. Made with hypoallergenic and eco-friendly baby alpaca wool from Bolivia, the sweater, hoodie, mittens, hat,and booties feature deer-like details such as whimsical spots or sweet ears, turning your little one into the coziest, cuddliest creature around. Although the Bambi collection is perfectly suited for making kids look right at home and feel warm when they are out in the elements, any of the items would be a hit at holiday gatherings or perhaps as a Christmas morning alternative to pajamas. We love that Oeuf is committed to Fair Trade and is helping to provide a living wage to the company’s female knitters in Bolivia. Getting our tots bundled up for the cold weather can be quite the process, but Oeuf's Bambi-inspired collection is so adorable, you won't even mind getting them all suited up. Made with hypoallergenic and eco-friendly baby alpaca wool from Bolivia, the sweater, hoodie, mittens, hat,and booties�feature deer-like details such as whimsical spots or sweet ears, turning your little one into the coziest, cuddliest creature around. Although the Bambi collection is perfectly suited for making kids look right at home and feel warm when they are out in the elements, any of the items would be a hit at holiday gatherings or perhaps as a Christmas morning alternative to pajamas. We love that Oeuf is committed to Fair Trade and is helping to provide a living wage to the company's female knitters in Bolivia.